Electro-pop duo Disclosure and your favorite super sensitive crooner Sam Smith reunited for their collaborative track “Omen,” and now there’s a music video to go with it. As previously noted, Disclosure had recruited Ryan Hope to direct a dystopian sci-fi short split into a four-part music video series. “Omen” will appear on Disclosure’s upcoming album Caracal, which sees its official release September 25th. It’s been a few years since “Latch” was released, and though “Omen” is slower and much funkier and Sam Smith much more svelte than ever, the Disclosure x Sam Smith team-up is still pretty magical. Disclosure’s Caracal, the follow-up to their 2013 debut Settle, won’t be out until September 25th, but the Lawrence brothers have released Part One of their short film. Though the electronic duo had recently released an album teaser their via this trailer, we now know that it’s actually for their Ryan Hope-directed sci-fi epic. The short film will be broken up into four parts, with the first acting as the playground for “Holding On,” Disclosure’s new single featuring Gregory Porter. If the endless string of young adult novels turned movies (of varying quality, because they can’t all be The Hunger Games) are any indication, dystopian futures are all the rage right now. Disclosure’s sci-fi short was shot in Mexico and centers around Mariela, the heroic liberator leading a band of rebels in a fight to take back the city from Robocop-esque soldiers. 1. Watch Disclosure and Mary J. Blige perform their version of “F For You”. 2. Happy Monday, everyone! Take a look through photographer Sophie Gamand’s series, Flower Power: Pit Bulls of the Revolution. 3. Listen to Best Coast’s Bethany Cosentino and Weezer perform new collaborative track “Go Away”. 4. John Galliano is reportedly making his return to fashion as creative director of Maison Martin Margiela. 5. Check out filmmaker Daisy Jacobs and animator Chris Wilder’s The Bigger Picture, a new animated short that blends 3D painting and 3D stop motion. 1. 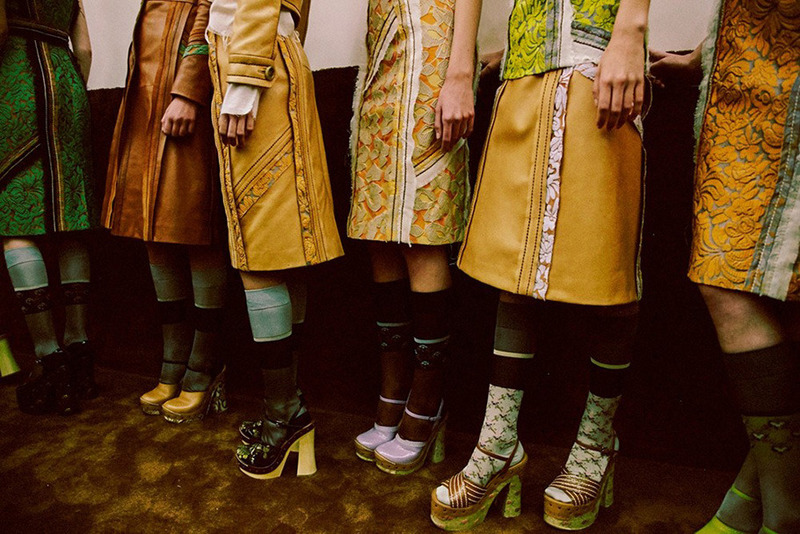 Miuccia Prada’s SS15 collection “[revived] the beauty of incredible fabrics,” bringing together ‘70s folklore and Victoriana redux and full leather skirts. 2. Speaking of the Prada SS15 show, Gemma Ward opened the show, returning to the runway after a six-year hiatus. This almost feels like a #FBF. 3. 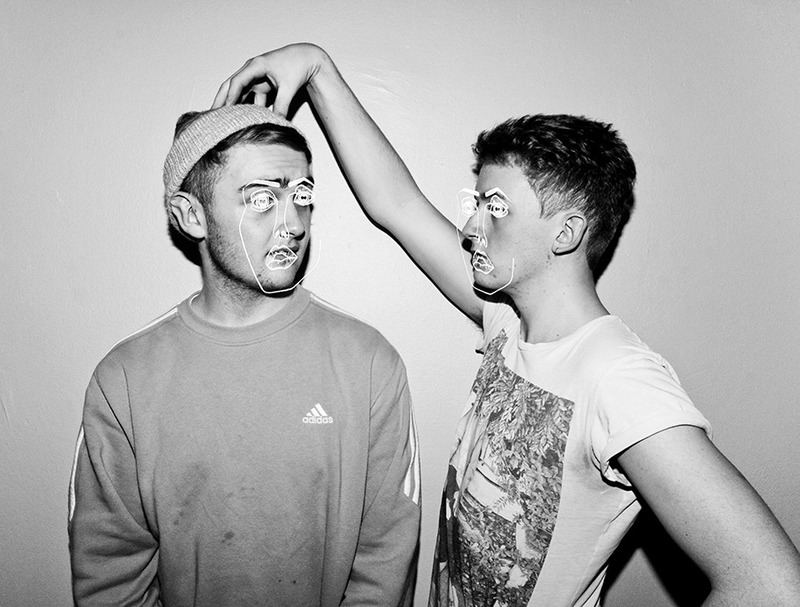 Listen to this remix of Disclosure’s “Latch” (ft. Sam Smith), now with lyrical contributions by Schoolboy Q. 4. Then listen to James Blake’s latest set with BBC Radio 1. Blake shares an untitled song, as well as a remix of Outkast’s “International Player’s Anthem” with his song “Pembroke”. 5. Artist Hiroshi Senju used acrylic and fluorescent pigments on Japanese mulberry paper to create luminescent paintings of waterfalls in his series Nightfall. 1. 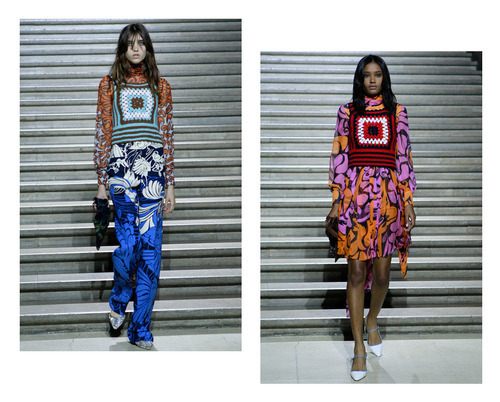 After a three year Resort hiatus, Miuccia Prada presented Miu Miu’s Resort 2015 collection. The result? Mega-cool digitalized (blown-up) ‘70s paisley prints.